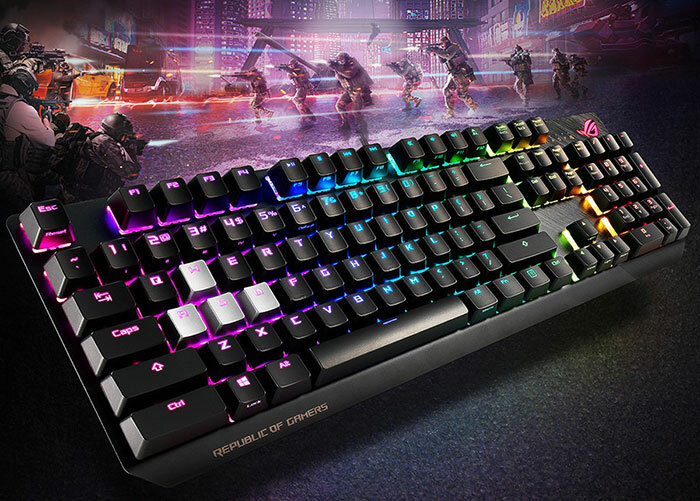 Asus has emailed HEXUS today outlining the capabilities of the new RoG Strix Scope gaming keyboard, and its pricing and availability. The Asus RoG Strix Scope was originally shown off back at the CES 2019, and it offers the following attractions; an oversized CTRL key, a one-touch Stealth key, quick macro recording, Aura Sync compatible RGB lighting, and Cherry MX RGB switches. Asus is targeting the RoG Strix Scope gaming keyboard at FPS gamers, which it says are people who will appreciate the oversized CTRL key and one-touch Stealth key. However, its easy Macro recording ability will be a boon to MMO players too, reckons the firm. According to Asus the extra-wide "ergonomic Xccurate Ctrl key means fewer missed clicks for greater FPS precision". The key is approx twice as wide as usual, and Asus has made room by making the left side Windows key smaller, so it is "less of a target". Other changes to the physical properties of the keyboard include a set of four silver-coloured caps for the vital WASD key group (optional, with key puller in the box). 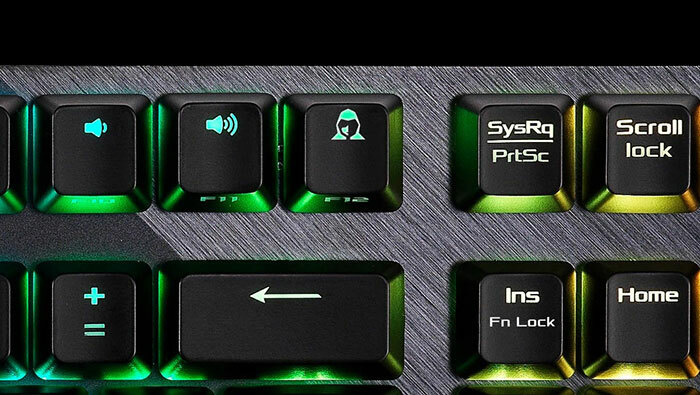 Another highlight of the RoG Strix Scope's keyboard configuration is the Stealth key. Stealth is the default setting for F12, providing a one-touch shortcut that hides all running apps and mutes all audio for instant privacy or peace. Asus suggests that you might use this when alerted of an incoming call / chat, or simply when anyone enters your lair, unannounced. Macro recording is said to be quick and easy. Users can "quickly map command sequences to selected keys, adjust settings with enhanced Armoury II software, and store profiles using onboard memory," says Asus. Asus adds that its Armoury II is "enhanced driver-based software that offers more extensive controls while using less system resources". Asus uses Cherry MX RGB switches in the RoG Strix Scope gaming keyboard. Customers will be able to choose from Cherry MX Red, Brown, Blue, Black, Silent Red and Speed Silver switches according to the press release HEXUS has been sent. RGB LED lighting is present with per-key Asus Aura Sync, plus an illuminated RoG logo. In the onboard memory, the keyboard can store up to six custom illumination profiles which can be triggered to apply to different applications. The F5-F12 keys have front-side illumination, so both media controls and F-key legends are clearly lit. A Quick Toggle Switch allows gamers to flip quickly between these two control modes. Asus won a 2019 iF Product Design Award in the Computer Accessory category with this new keyboard. This handsome peripheral offers and appealing aluminium top plate "with slash aesthetic for everyday resilience with a dash of style". In its email to HEXUS, Asus UK said that the RoG Strix Scope gaming keyboard will become available at retail here in the UK this month. The MSRP is £149.99.